This guide will show you how to create a customized Vehicle panel with a Text and Icon notifiers in it. Text notifiers are useful to display device input data straight into the Vehicle panel. In the same way, Icon notifiers are very handy, for example, to quickly understand the status of a signal at a glimpse. Text and Icon notifiers are linked to Event Rules. Inputs from your devices are captured and generate events that display the values. So we need to create an Event Rule using both Text and Icon as Notifications. 1. Go to Admin > Event Rules from the application's menu. 1. Input a Name for your event rule. A description is recommended. Keep the rule Enabled if you want it to be active. 2. Select your user tag. 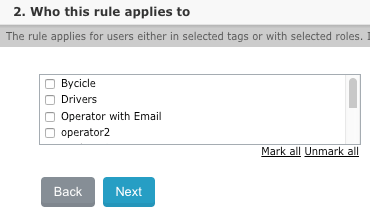 If you don't select any user tags, the rule will apply to all the users. A User it could be any user type, like a vehicle or a driver for example. 3. Select Always active if you want your rule be active at all times. Or select Activate on Schedule if you want, for example, the rule to be active during work hours, some rules might only make sense on weekends. The option Finish events automatically when outside schedule means that the event will be closed without the need of false of the initial conditions. 4. On 4. Expressions select the variable/s that will trigger the event. In our example we want to display the Charging status icon, so we will use the variable Charging. Select the variable according to the Device Mapper configuration for your devices. 5. On 5. Notifications you need to select the Icon option and add a second choice for Text. In Icon you will select the icons you want to use when the expression is active/inactive. In Text you can type any text you want and/or combine it with existent variables if needed. This step is optional. For this exampe we won't select any value here. We click in Next. Click in Save to finally save your Event Rule. 1. Refresh the browser after the creation of your Event Rule. 2. Add the columns with the names created in step 5. You can read more about adding columns to your workspace here. You can also use both Icon and Text notifiers with Marker Attributes. Now you'll be able to see your vehicles with both Notifiers on the map.